In the Netherlands you can charter a Linssen yacht in Friesland. A fantastic way to discover the Netherlands from the water on board your Linssen motor yacht. The Netherlands has a long tradition of boating. It is a country of expert shipbuilders and the home of ‘your’ Linssen as well. Boating is simply part of life for the Dutch, and the country’s infrastructure refl ects this. Splendid modern marinas await you, equipped with every imaginable facility and off ering countless moorings in picturesque villages, towns and countryside. With so much variety, there’s something for every boating enthusiast here. Slow-moving currents, rivers, canals, lakes, gravel lakes and the North Sea coast ensure a stunning variety of diff erent landscapes and many diff erent pleasures. The Netherlands – known for its windmills and wooden shoes – has enormous historical, cultural and gastronomic riches to offer. Sail with Linssen Boating Holidays® to wonderful destinations, in the unique Province of Friesland on Lake Fluessen, Slotermeer, Tjeukemeer or Sneekermeer. 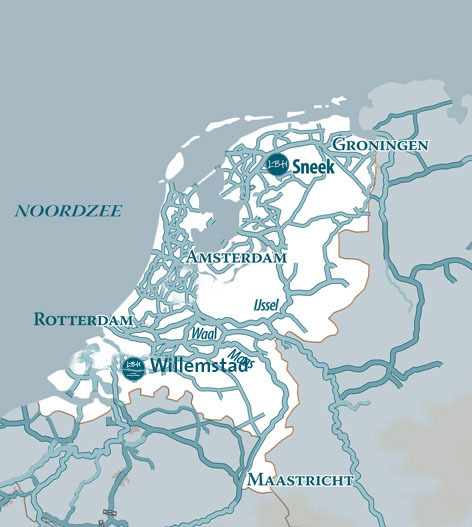 The Netherlands – a boating paradise, with Linssen Boating Holidays®.